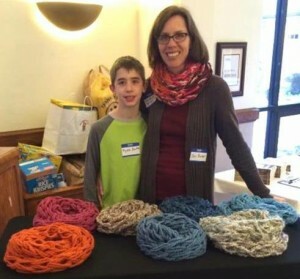 Jen Baker and her son Ryan sell some of the scarves Jen makes for The Scarf Farm, which raises money for a Romanian women’s shelter for survivors of human trafficking. Jen Baker traveled to Bucharest two years ago, and what she experienced left a lasting impression on her. So much so that she recently started her own business that she runs out of her dining room, donating every penny she makes to support a worthy cause there. Jen, a member at Paoli (PA) Presbyterian Church, has opened up The Scarf Farm in her home, making scarves that she sells for $20 apiece. Roughly 75 percent of that money is being forwarded to Romania where a women’s shelter has been set up for survivors of human trafficking. In just two months’ time, Jen has sent $920 to the Romanian shelter, a place she visited in 2013 while on a mission trip with her church. Jen recently received a matching funds pledge from a member at Paoli PC. This person is matching any money Jen sends to Romania between January and April, in essence doubling the contribution to the shelter. It’s all kind of humbling to Jen, who is seeing her fondness of making scarves blossom into something very special. 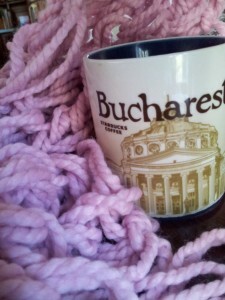 A scarf is nestled against a mug depicting a building in Bucharest where Jen Baker found a strong connection to a women’s shelter. Jen’s scarf-making business started around Thanksgiving when she watched a how-to video on arm knitting. Thinking it would be a perfect project for Jen and her son, Ryan, to do for Christmas gifts, they made about a dozen scarves for family members. Jen enjoyed making the scarves so much that after Christmas she decided to keep making them and donate any money she made back to a worthy cause. Remembering the shelter she visited while in Bucharest, Jen immediately thought this would be the perfect place for her money to land. Jen is not sure what specifically the money goes to at the shelter. She speculated that it could go to construction costs for the shelter, which is more like a big house than a shelter. There are also educational needs for some of the younger victims that the money could go toward. The shelter was started by Moni Boseff, who is the executive director of the Open Door Foundation in Minnesota. The safe house, the only shelter of its kind in Romania, takes in women from all over Europe and provides medical, psychological and social support, helping the victims heal physically, mentally and emotionally. As part of the recovery process, Moni has started a job skills training program with the help of Starbucks Coffee Company, which employs Open Door graduates. There are 27 million people currently in slavery around the world, the highest slavery rate ever, and human trafficking is the world’s second most profitable crime, trailing only drug trafficking. Read more about the shelter and its history here. When Jen went to Romania with Paoli’s mission team she was visiting the family of Mike and Kris York, who are missionaries in Bucharest that are supported by Jen’s congregation. Kris volunteers at the shelter and took the mission team to the safe house. 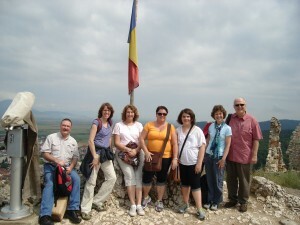 This was the mission team from Paoli Presbyterian Church that traveled to Romania and eventually visited a safe house for which Jen Baker now makes scarves to support. Jen’s passion and desire to help the women in the shelter go into her scarf making. Jen, who is a part-time paralegal for a law firm in Philadelphia, is the sole maker of the scarves for The Scarf Farm, spending about 40 minutes on each one. She has a listing on her site of ones she has in stock, but she also takes custom orders so people can buy ones that match an outfit or represent a favorite team or school. Jen isn’t sure how long her scarf-making business will last, especially since spring is around the corner and people will be putting their scarves and mittens away. She does have some orders for presents for next Christmas already. But she never thought it would grow into what it has, so she’ll just once again put her faith in God and let him lead her where he wants her to go.